It’s the third day of SilentMode’s Store Crawl 2017, and it’s also the first of three “doubles”. My first stop was Leeds, which is another city I hadn’t visited before. Lessons were learned from the previous day, as I’d booked my train ticket in advance and made sure I knew which train I was catching. What really helped was that it was a direct route, and having an early checkout from the hotel wasn’t bad either. Interesting things about the city. My immediate thought: Leeds is symptomatic of the overall agenda to turn every major city into an oversized shopping centre. The Trinity is virtually identical to Westfield, or any other outdoor/indoor shopping centre you can think of. For the more adventurous of us, stepping outside the gentrified perimeter will expose you to some northern architecture and open spaces. However, most of the city centre has been modernised. Leeds is also where I started an interest in geocaching. As I was going to be doing all this travelling, I thought, might as well give myself an incentive to explore. I found my first geocache just before I headed out of Leeds. 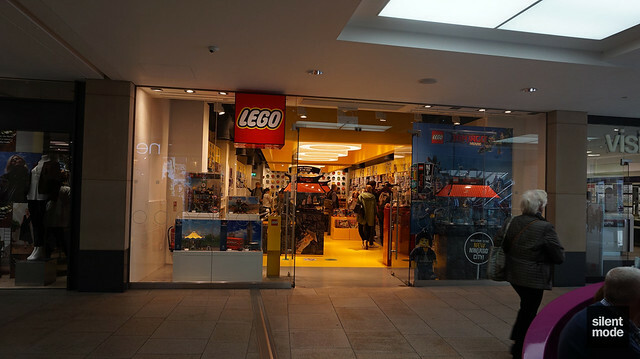 Very conveniently, the LEGO store is a six-minute journey from the train station on foot – although it’s a little tricky to find. It’s roughly the same size as the Westfield (Shepherds Bush) store. You might have seen these remote control vehicles if you’ve been to one of the LUG-run events in recent years. 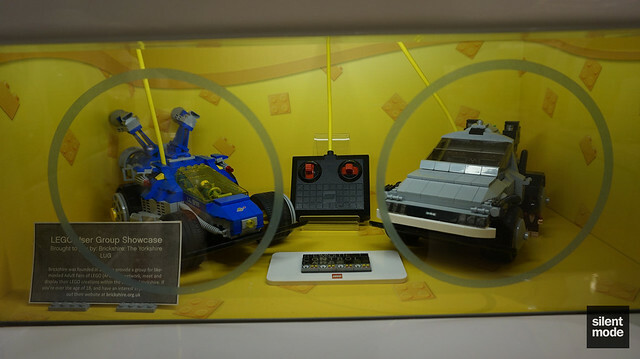 These are based off of an old LEGO remote control set from way back when. However, apart from being associated with the Brickshire user group, they’re uncredited. The Pick A Brick (PAB) wall. As usual there’s a dedicated Flickr album to see the actual photos taken. Different this time is that I didn’t apply any colour correction or adjustment to them. At first, things appeared to be going the same way as with Newcastle. I was greeted at the front of the store by a staff member, but only “hi” was exchanged. So I did the same thing as I did in Newcastle: I took off my jacket to expose my promotional t-shirt. This time, as I was taking photos of the Pick A Brick wall, a staff member recognised the list of stores on the back. We then got into a brief conversation about the Store Crawl. I should mention (if I hadn’t already) that I’d intended to bring some business cards with me. These cards would have been used to promote myself as an AFOL, and I would have left them with each store so they would know of me. Unfortunately, the courier responsible for delivering them before I’d left had decided not to. So instead, I used the opportunity to promote Swapfig. I’ve already headed to Sheffield, where it turns out that the LEGO store is yet again over an hour away on foot. And the crazy thing? I’m talking myself into doing some more walking!